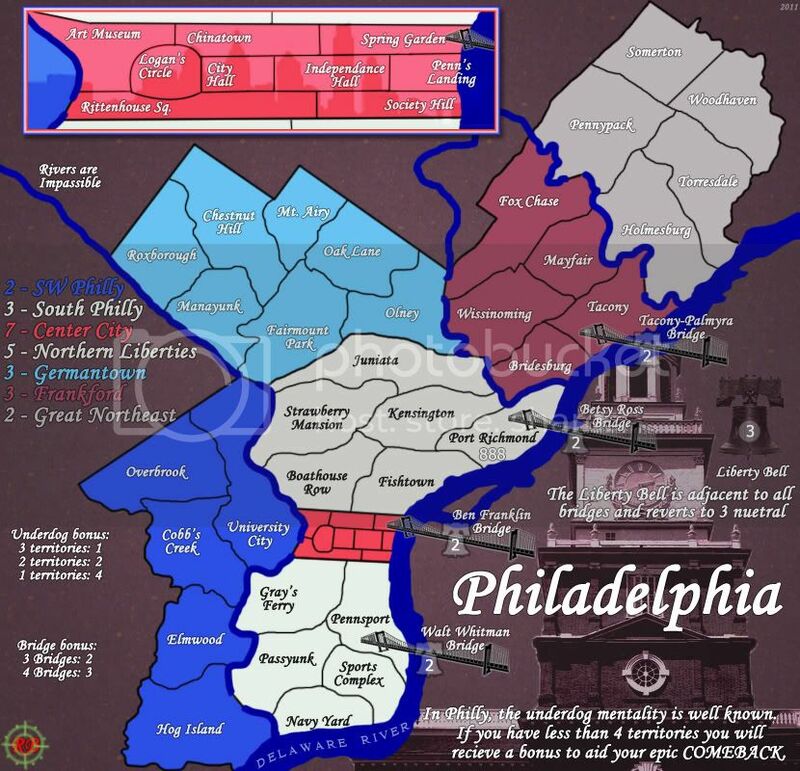 Seems like there has been some previous interest in this subject, and as a resident of the Philadelphia region one that is near and dear to my heart. Before going very far into this, I'd like to gauge public opinion on the subject of a Philadelphia map. I'm generally in the category of simple, well balanced, classic style maps, and I'd like to put this one into production with that goal in mind. But if there isn't really an audience, I might try something else. 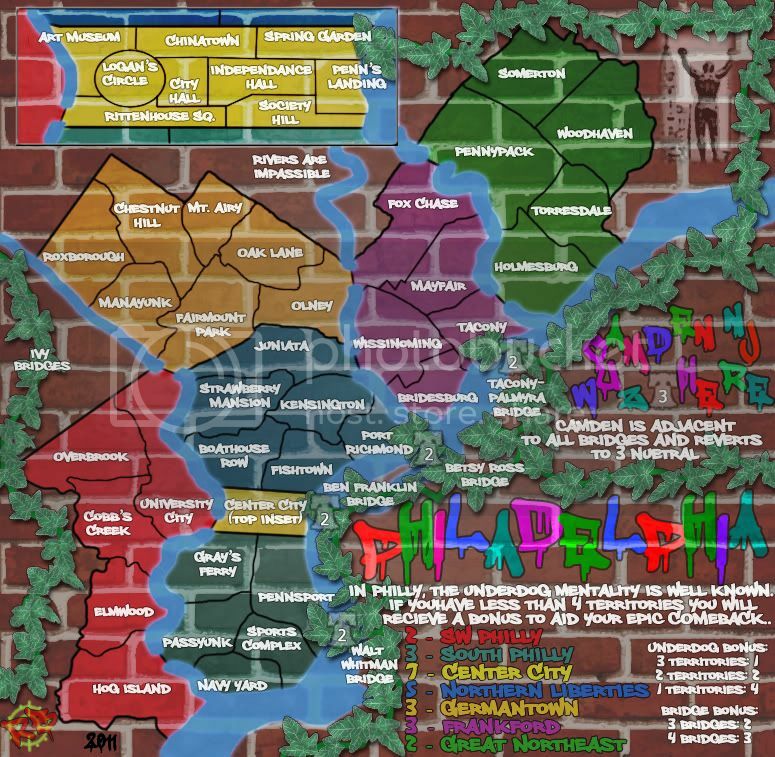 I have in mind a few things: I would like to keep the highways/subways off the map, while often used on other maps to show the congested traffic patterns of the region, I want to show the regions of Philly without these distractions. 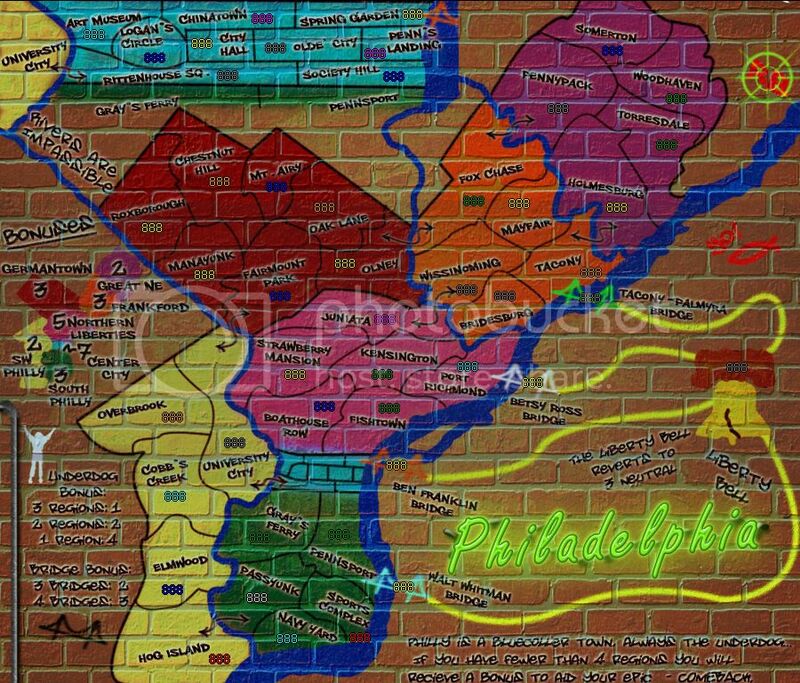 I've spread out to include areas just across the Delaware River in New Jersey which often are included as part of "Philadelphia." 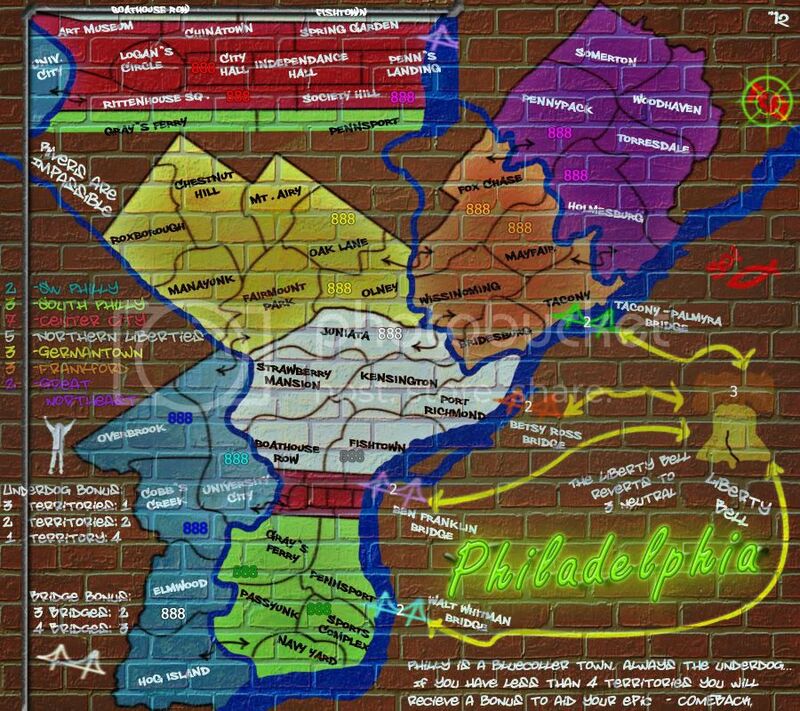 And I've reverted back to just Philly, been toying with a bridge bonus, finally have that realized. Added a killer neutral... reverts to 4 at the moment, basically calling it the "Bridge Toll" - HA! 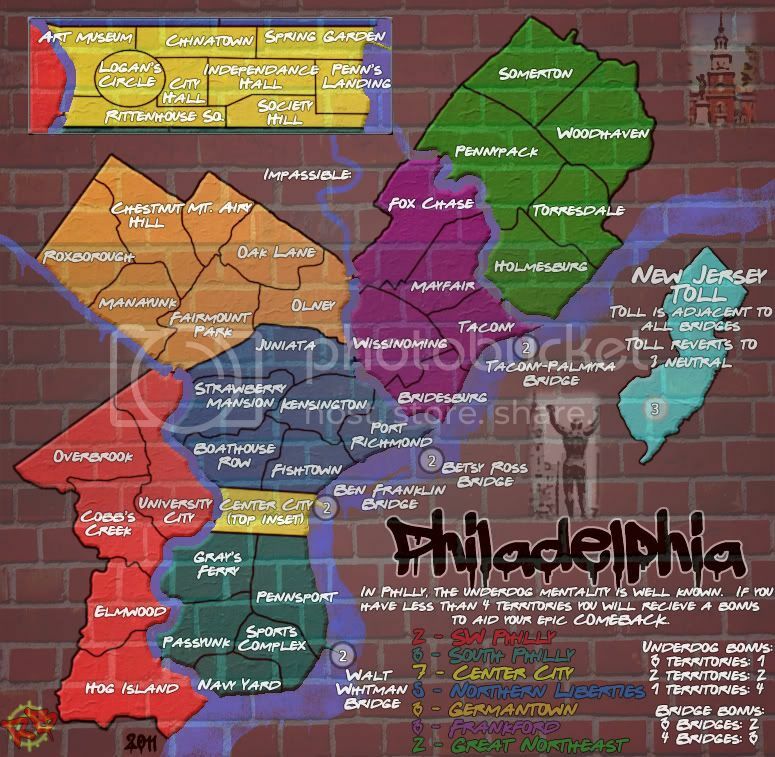 Added Center City bonus insert. The so-called "underdog" bonus can still be toyed with and debated, but may not be needed now, maybe.... The connection are to be debated, as well as bonus regions and their values, but the division I have now I expect won't change too much. 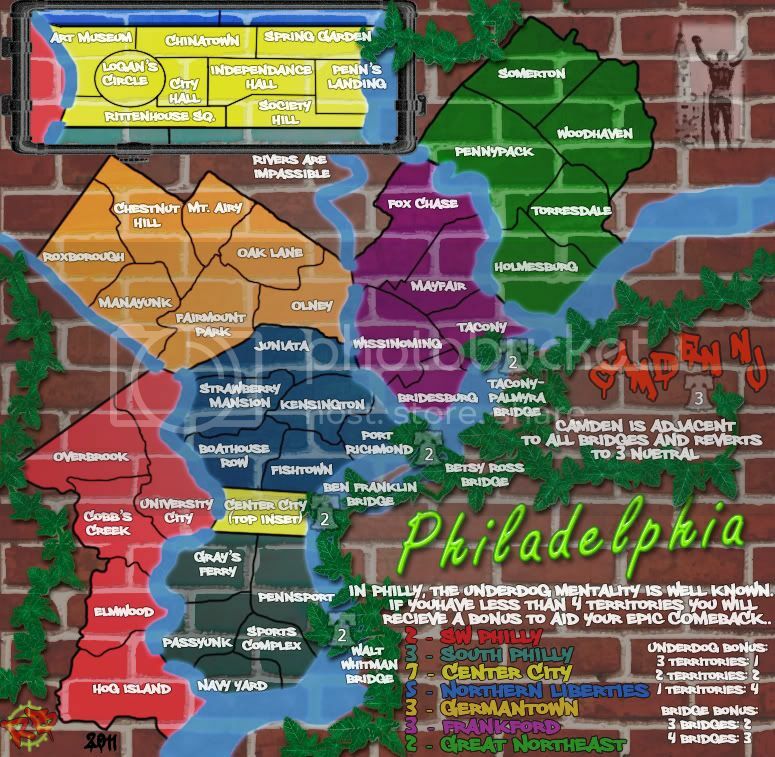 Naming should be pretty solid, but there are a ton of different names for areas, and can easily be renamed if something out there better represents a specific neighborhood in Philly, but I'm pretty sure I've hit most of the most well known neighborhoods. Figuring a list for bonus legend, but not opposed to a mini-map, assuming it will fit. Bonus region values are guestimated for the moment until I crunch some numbers. Graphics are generally simple for now. Unique "underdog" bonus system for players having only 3 territories or less remaining. This map represents the fighting spirit of the City of Brotherly Love: Philadelphia, Pennsylvania. 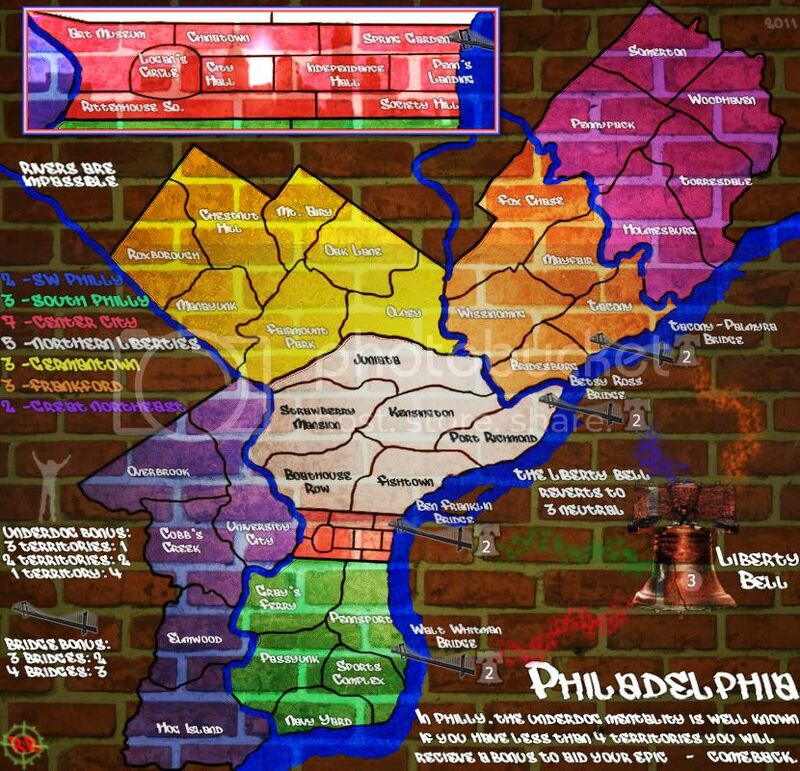 The regions are sections of incorporated Philadelphia County. 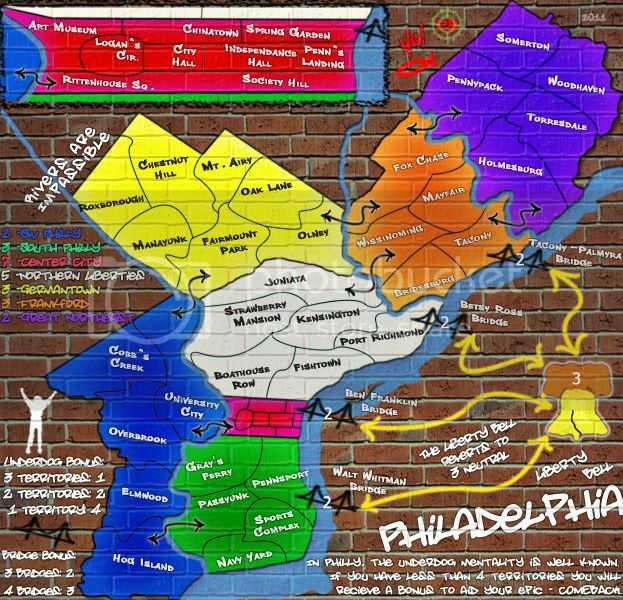 While each section has its own name all these areas have their own history and personality, but make no mistake they all come together to make the -CITY- of Philadelphia. 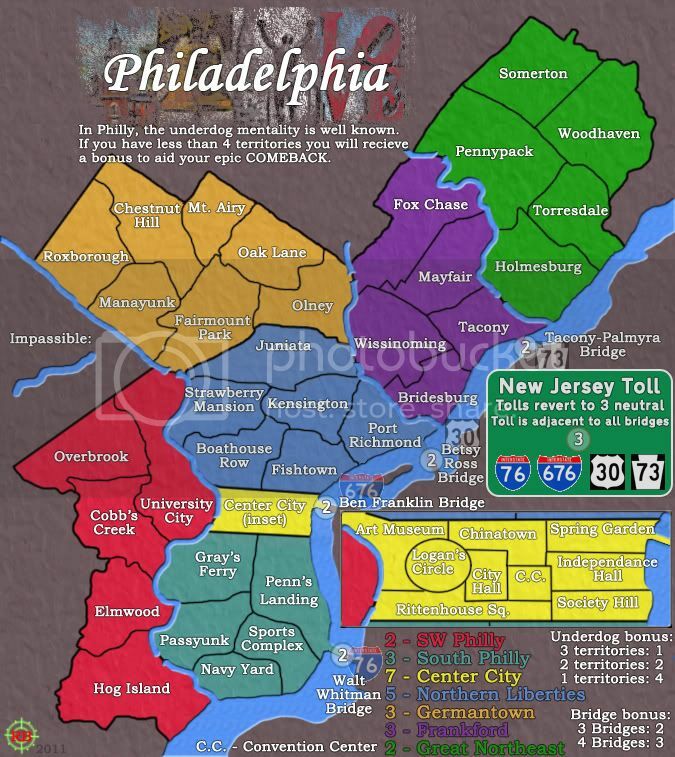 The gameplay is pretty straight forward with 46 classic style territories and one killer neutral territory that allows swifter and pinpoint access north and south via the bridges across the Delaware River. 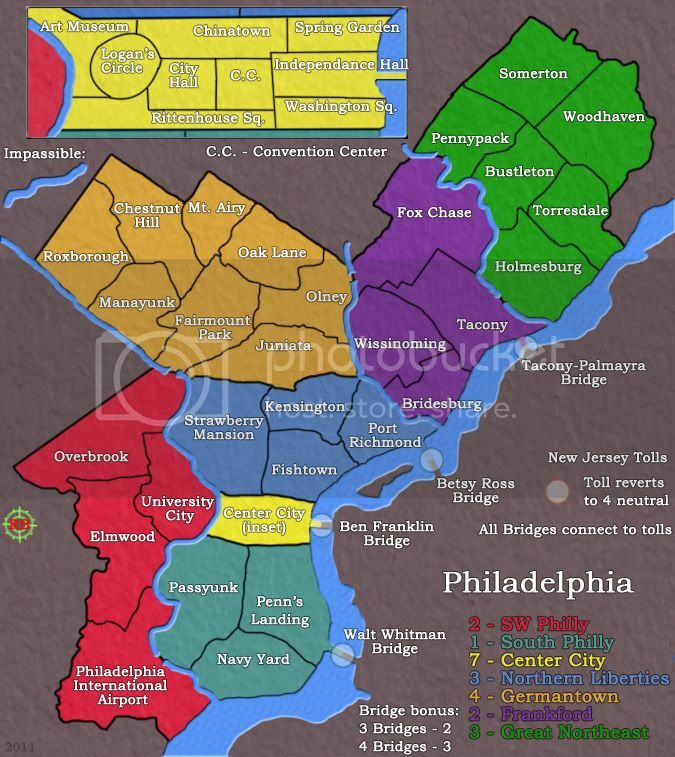 The bonus structure is also classic in nature for the most part save 2 exceptions: the first is a collection bonus for the bridges across the Delaware, +2 for 3 bridges, and +3 for all 4 bridges. 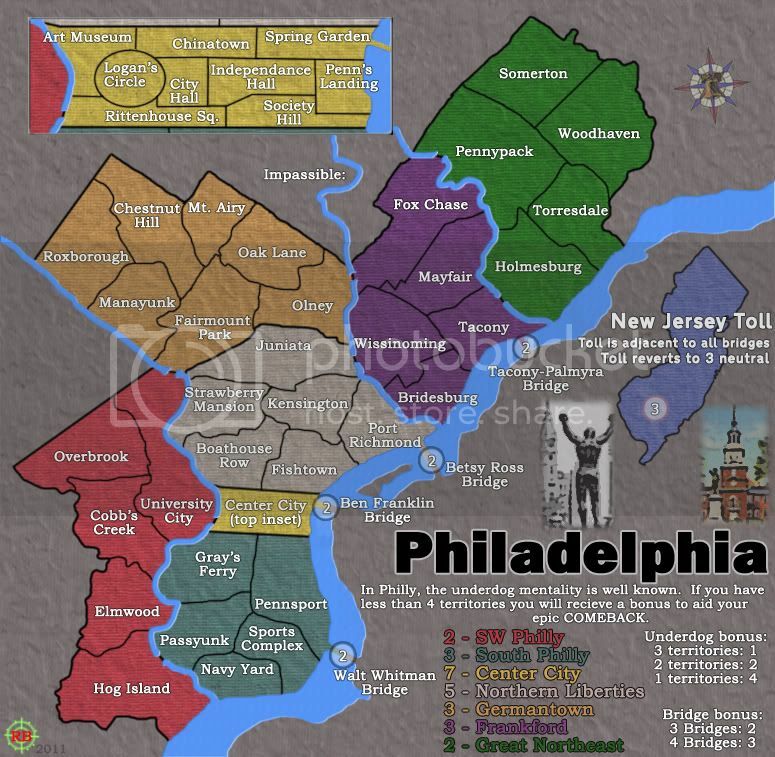 The second bonus exception is the most unique, called the "Underdog Bonus" for the underdog mentality well know in the blue collar city of Philadelphia. When you drop under 4 regions left on the board you will receive a bonus based on how many regions you have left: +1 for 3 regions, +2 for 2 regions, and +4 for just 1 region. You will always have a chance to win a game on this map, no matter how far behind you get! The author retains copyright on their work, and gives Conquer Club permission to use the imagery free of charge, for as long as Conquer Club sees fit on the Conquer Club website. Conquer Club cannot sell, lease, or lend the right to use the images to anyone else. 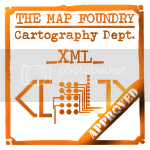 The author swears that their map is their own work, or a legal derivative work and by submitting it, do hereby claim all responsibility for that being true. Last edited by RedBaron0 on Thu Jul 25, 2013 6:11 pm, edited 17 times in total. 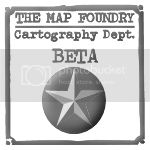 Nice to see you back in mapmaking, Rb0. 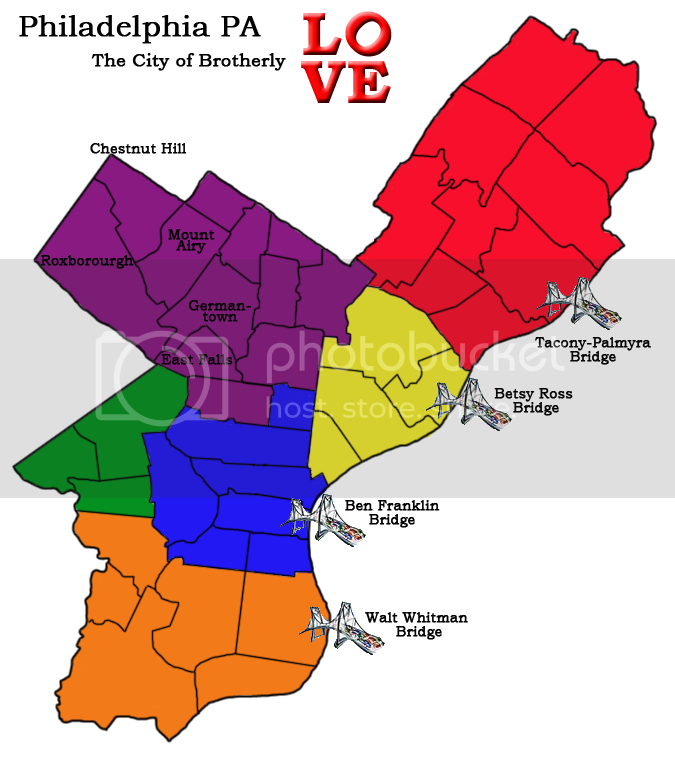 I'm tired of maps with metro lines... I like where this is going! 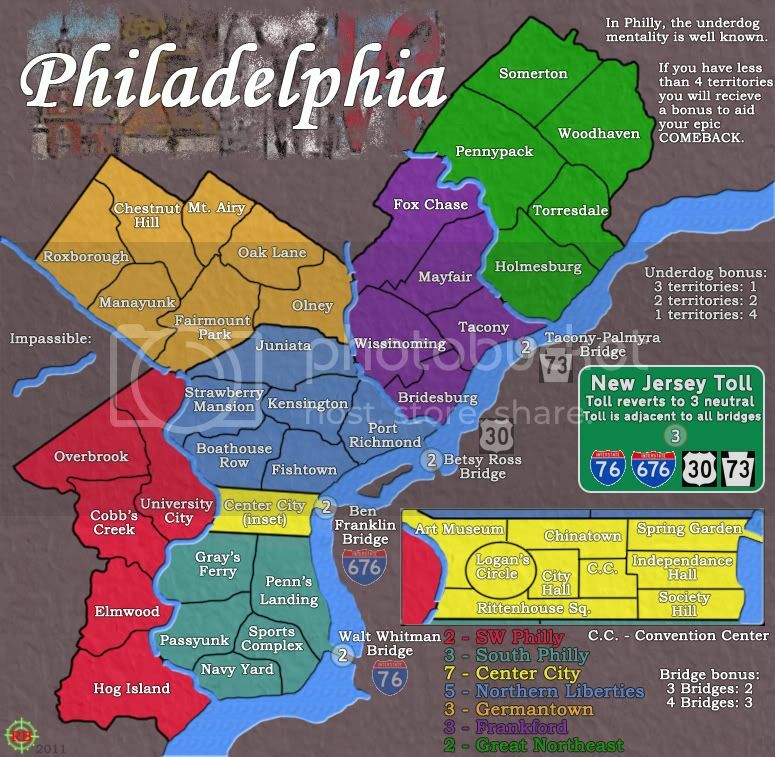 Are you doing modern Philadelphia? 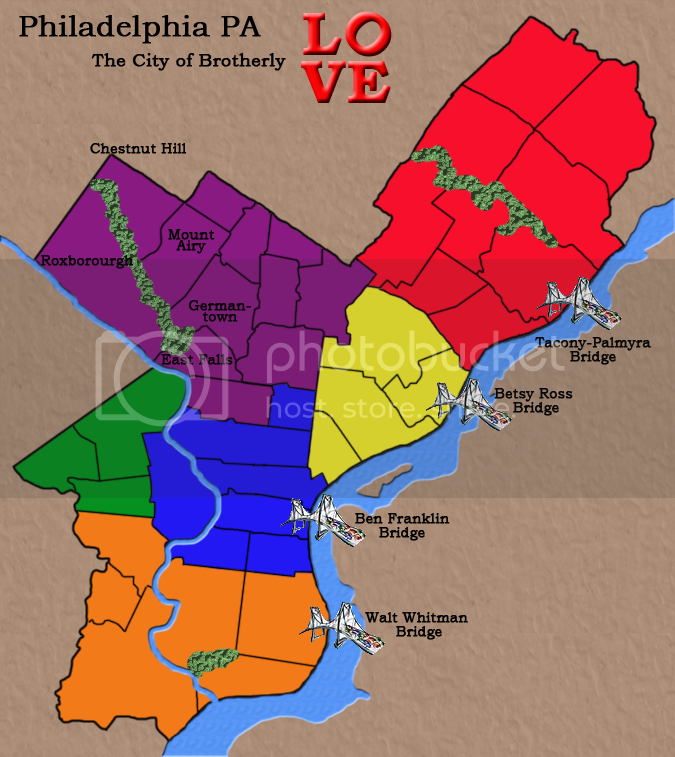 You and your historical maps IH... lol Much as it fits into the time of year, I'm looking more at modern Philly, the blue collar town known as the City of Brotherly Love. Love some more feedback, I shall endeavor to get a rough draft up up tonight. Still a number of region names to figure out, the connection are to be debated, as well as a few of the smaller regions in NW Philly may be consolidated for the sake of space and playability, and of course and the additions of impassibles to the map must be done. 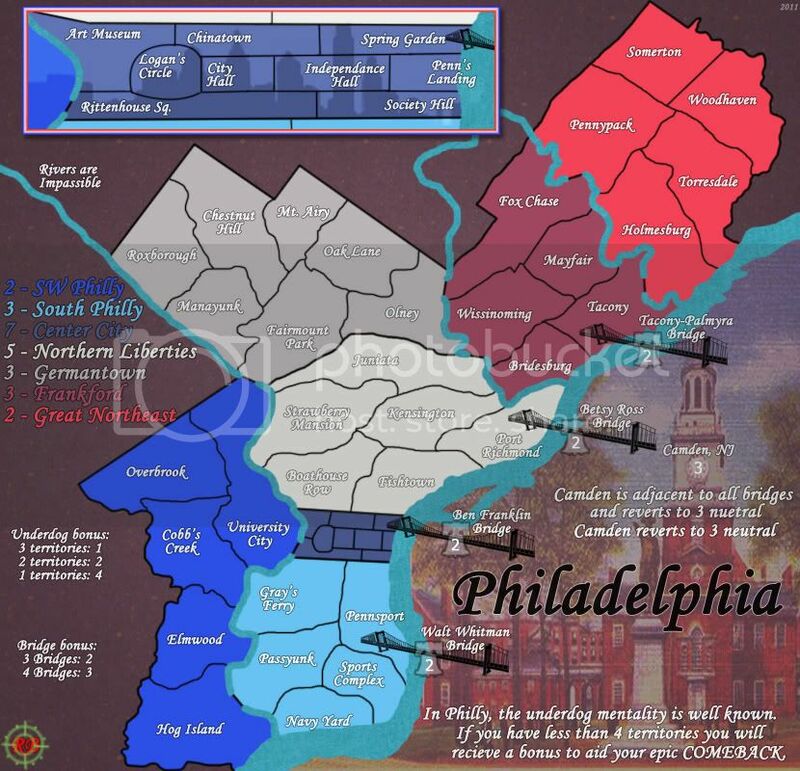 (parks-Fairmount, FDR, Pennypack; rivers-the Delaware & Schuylkill) Bonus regions can be debated as well, but the division I have now I expect won't change too much. Figuring list for bonus legend, but not opposed to a mini-map. 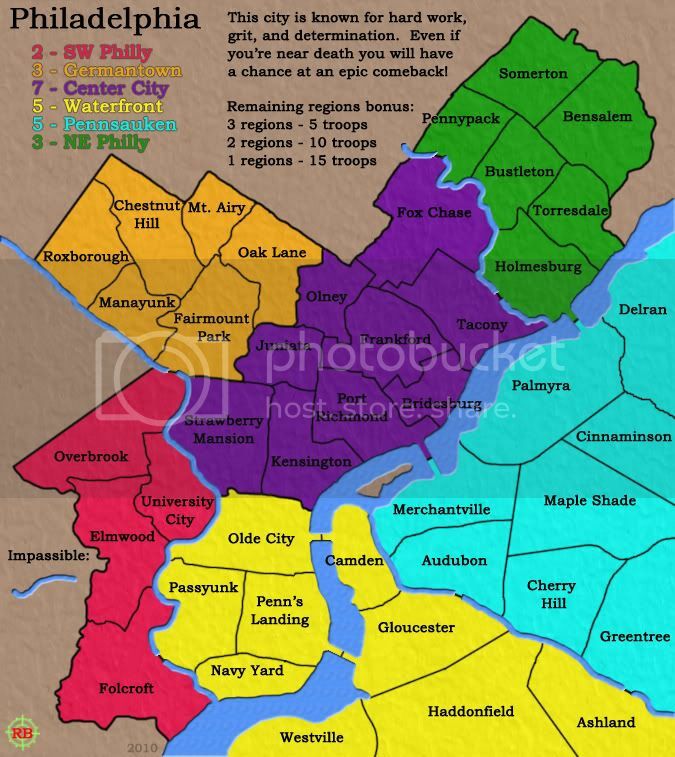 44 territories (for the moment) I might entertain the idea of having the areas of western part of the map be big territories representing the suburban counties, thus connecting the western side of the map within 2-3 territories from north to south with no or little bonus. But I'm not really sure about that. Each bridge is a territory that connects to each other and I figure is a bonus when all 4 are held. (Thought about a 5th bridge, but the Commodore Barry Bridge is further south almost to the PA-DE state line. The little suspension bridge icon isn't bad, but probably is just a place holder. The river would be nice to see. And I'm wondering how open this map is gonna be cause at this point, its too open for my tastes. Yeah I'll at least throw in (badly) where I think impassibles will likely go so you can see the map isn't so open. Impassibles added, bonuses and territories will likely be redrafted based on impassible placements. 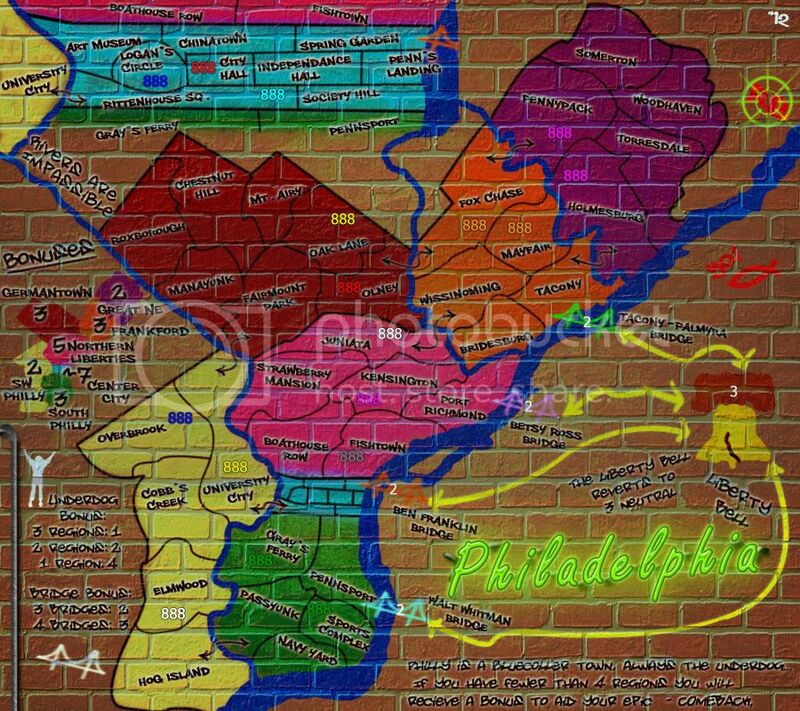 The initial draft I based divisions on postal divisions of the city, each neighborhood has their own distinct name, but all have postal codes for "Philadelphia." 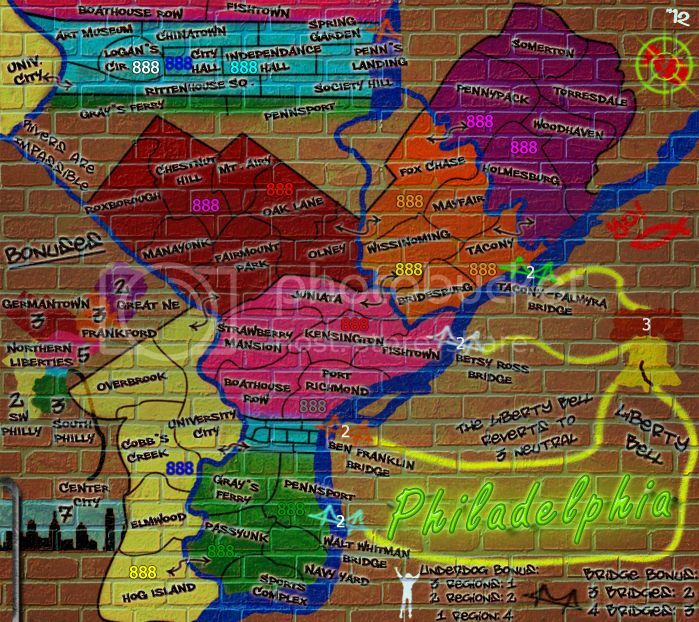 The parks will likely add a little girth especially Fairmount Park. 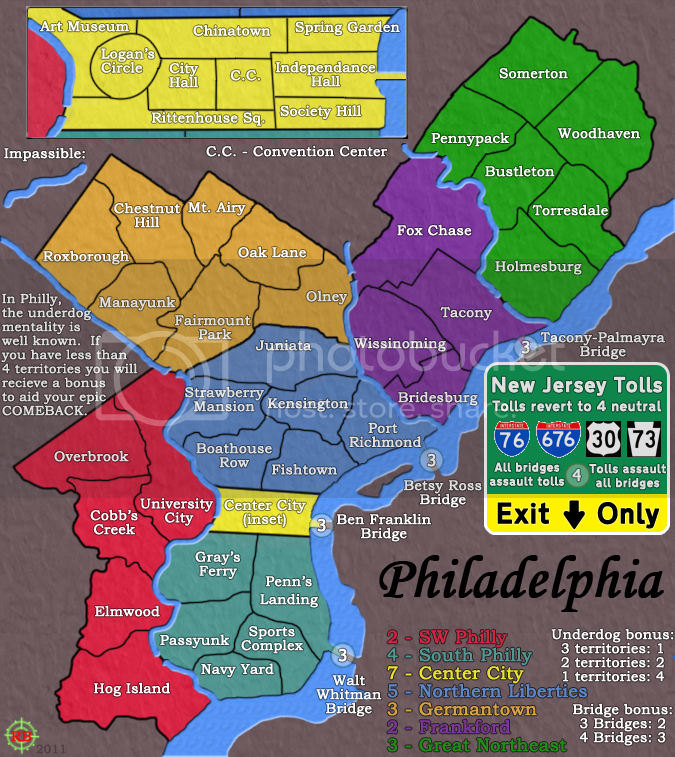 (NW Philly) Crossing points over the Schuylkill River can be debated, but I'm figuring only 1 or 2. A little tiding up is needed, but not important graphically. 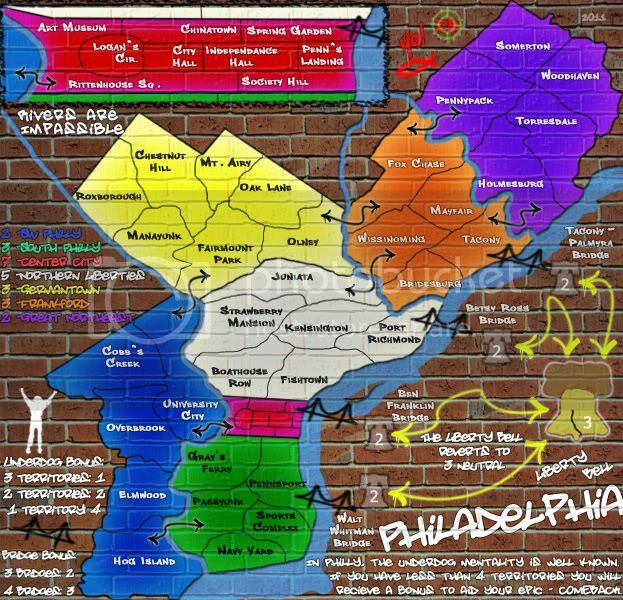 A modern-day Philadelphia map isn't too interesting for me. However, a historical city map---sounds like something I'd support. 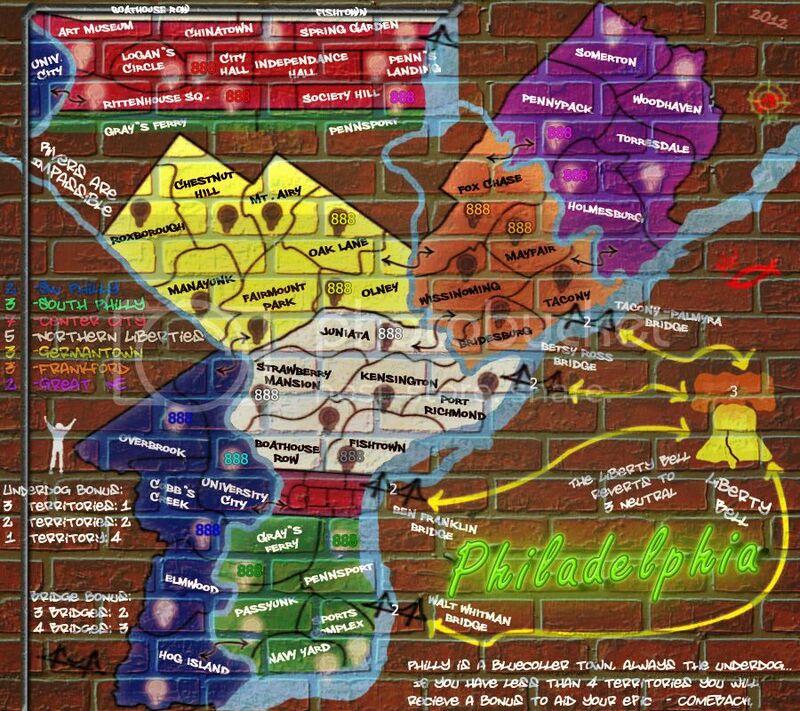 And certainly Philadelphia has a history to build upon. I just moved to Philly and think this is a great idea. The draft you have now is of the county of Philadelphia, not the city, right? 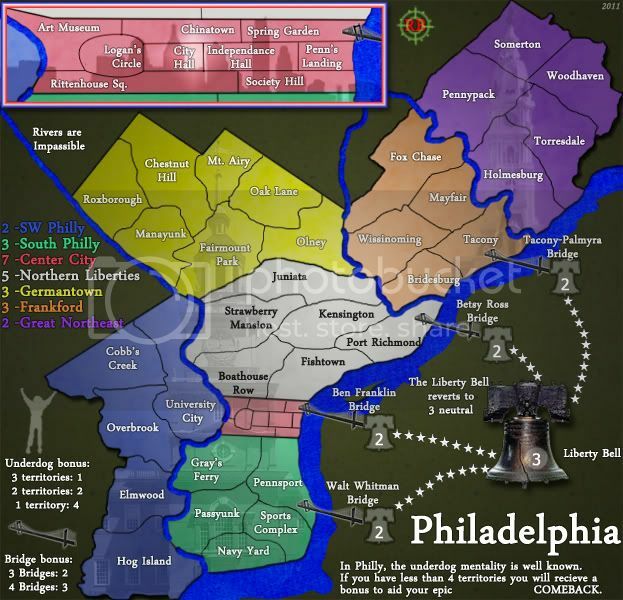 In my opinion, zooming in a bit on the city would allow you to include much more of the history and culture into the map. 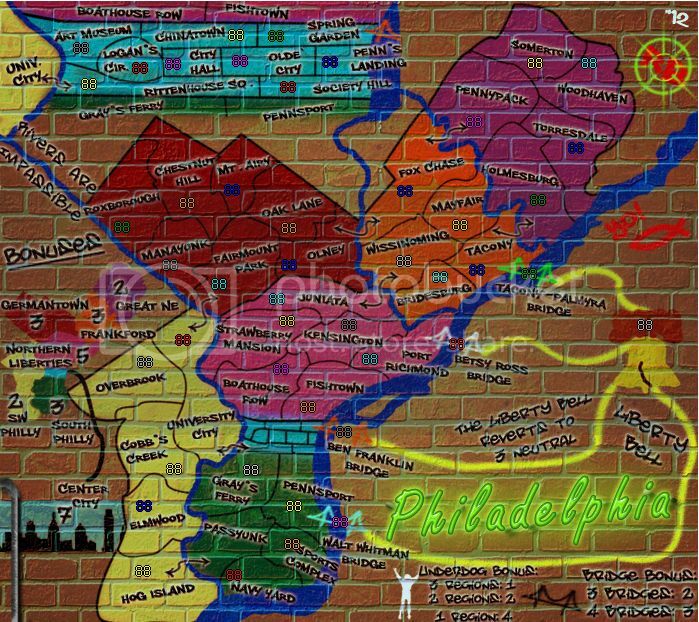 I for one am all for this map. Gotta represent the home turf. Still, a lot of work to go in all areas. Instead of the bridges, you might have surrounding counties as territories: Bucks, Montgomery, Delaware on the Pennsylvania side and Burlington, Camden, Gloucester on the New Jersey side (you can make Philly's city bounds impassable except for select connections so that the city isn't ludicrously exposed on one side). The parks aren't particularly interesting right now. They're all entirely internal to bonus regions so they don't offer anything in the way of useful defense. If the far Northeast was a separate region from the near Northeast, for example (as here), the park might be more impactful. If you can't make the parks mean something gameplay-wise, don't include them. I like the idea of incorporating Philly's history to some degree. We do have a lot of it laying all over the place. 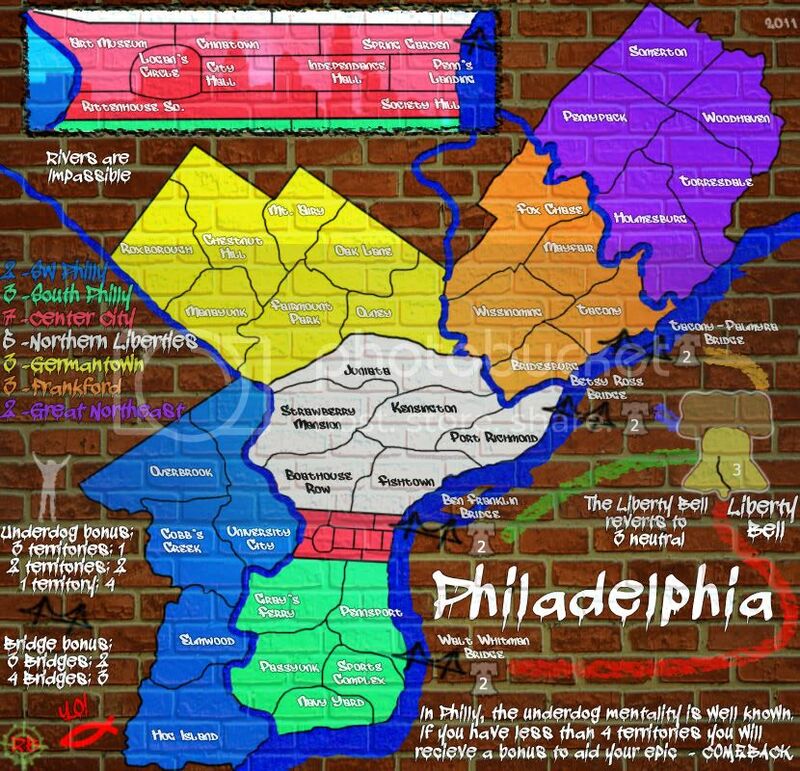 One thing that's somewhat unique about Philadelphia how many American firsts it has: The first hospital, stock exchange, public library, university, art museum, mint, water works, fire department, zoo, botanical gardens, World's Fair, skyscraper, and capital. It was also where Franklin made his numerous inventions and pioneered the modern science of electricity, and two centuries later the site of the first general-purpose electronic computer. 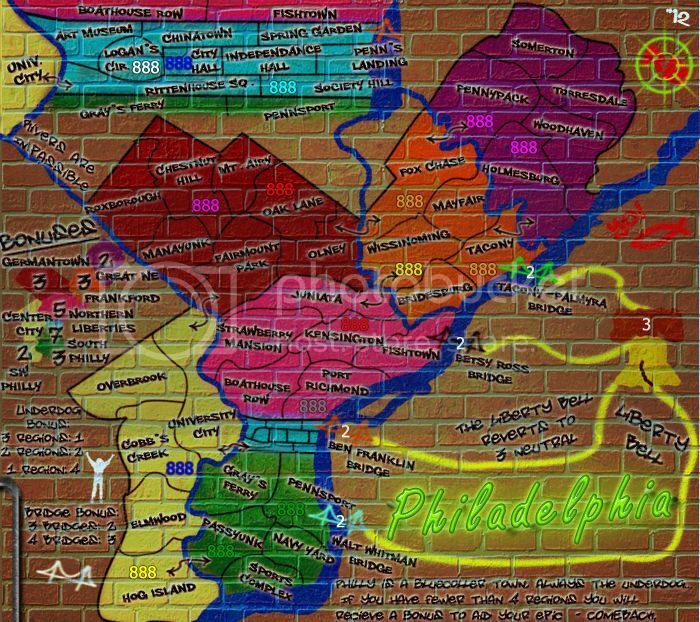 Then again, you might also focus on more modern culture... Maybe put auto-deploys on the best cheesesteak spots? The county of Philadelphia is incorperated, like NYC. 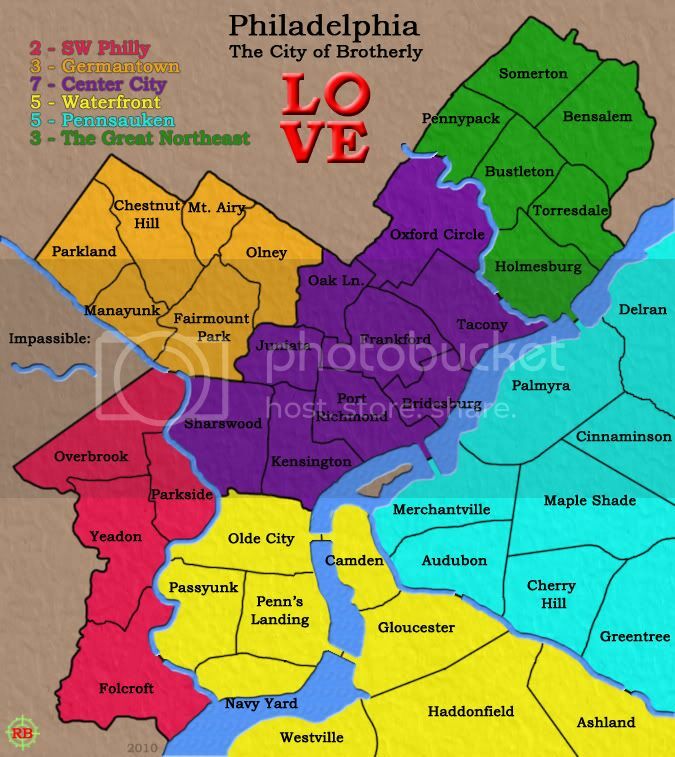 So county is the same as the city. 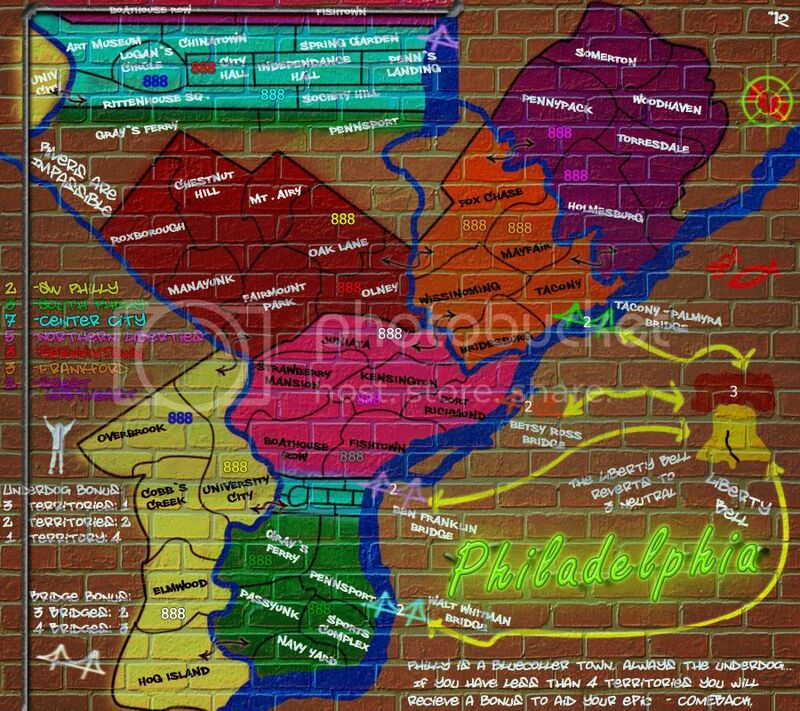 I wouldn't be opposed to expanding to include the surrounding areas... I would get a kick out of having a territory on the map to represent my home townin Delaware county. 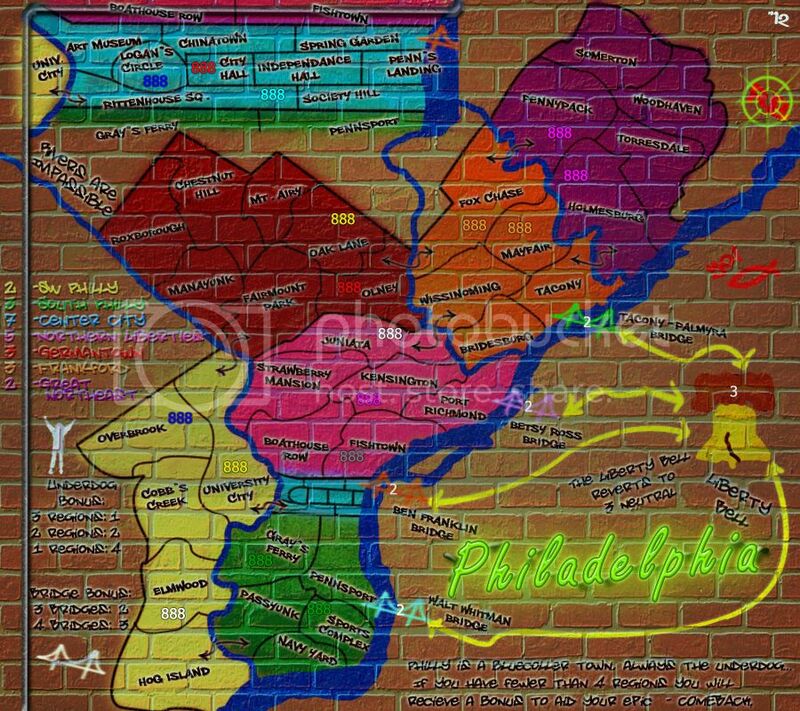 And really Philadelphia isn't just the city itself, it's the whole region, SE Penn, Delaware, South Jeresy. Gonna be busy for me next couple of days, so I got some time to think and figure stuff out. Keep commenting and give me more to think about! 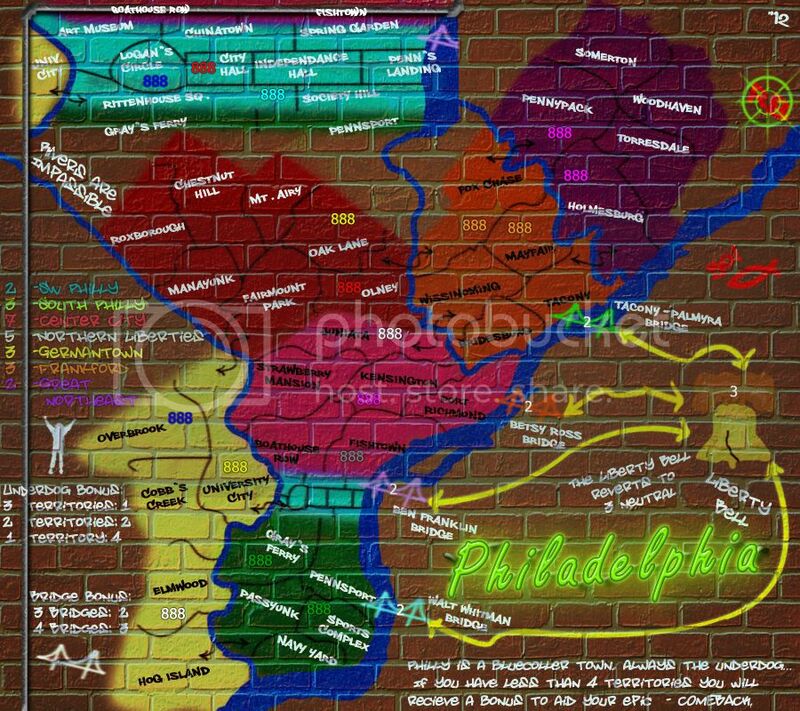 AndyDufresne wrote: A modern-day Philadelphia map isn't too interesting for me. However, a historical city map---sounds like something I'd support. 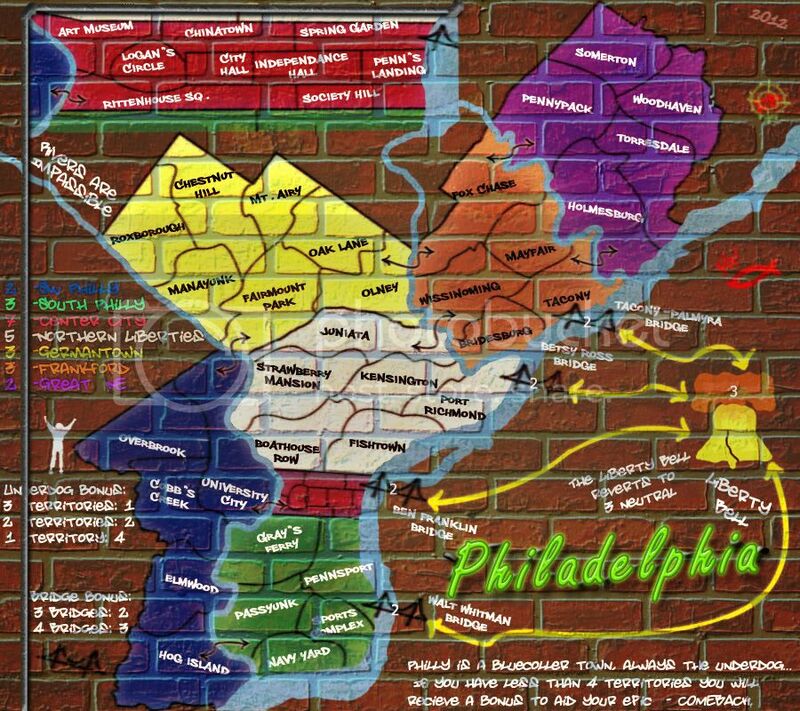 And certainly Philadelphia has a history to build upon. 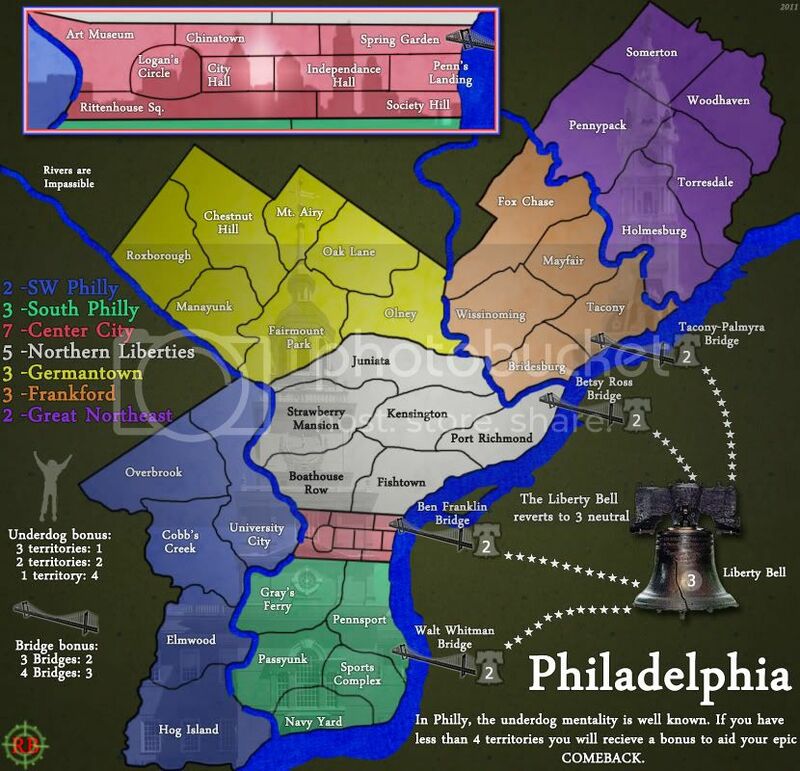 This is my second post in the foundry, so take this for what it's worth, but I love the idea of either an historical or a modern day Philadelphia map. 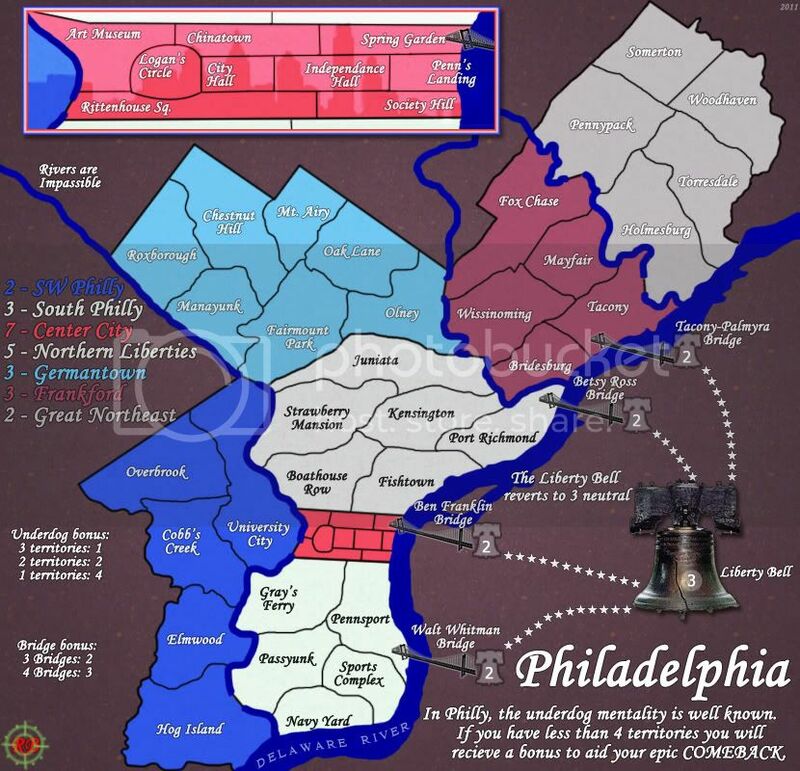 The historical map could work, especially with respect to the 18th century, but you might not have as many territories and would be limited to the Olde City area of modern day Philadelphia (and, of course, Penn). I think as long as I can make the map look good and be fun to play for the community I think the map could be of the middle of nowhere'sville... Case in point, Charleston. 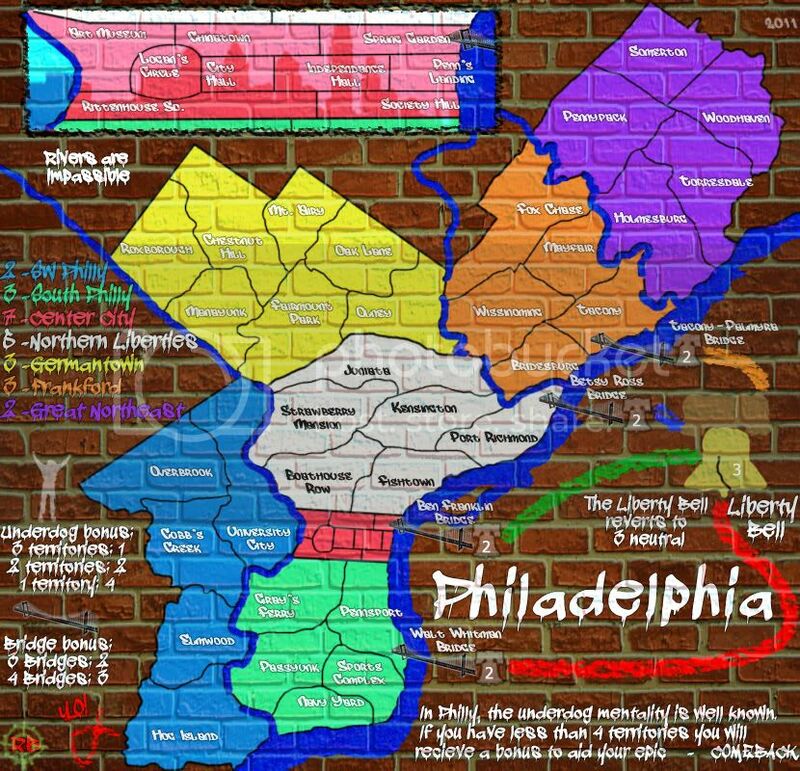 Not that I'm as good as rj, but that is a fantastic map of a... less than major American city and that map is one of the pillars of map library. I'm probably going to try and run with this expanded to include the nearby burbs. We shall see where it leads. 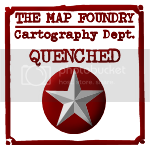 A historical map might be nice... but isn't really lighting my fire. Maybe someone can twist IH's arm on that one. 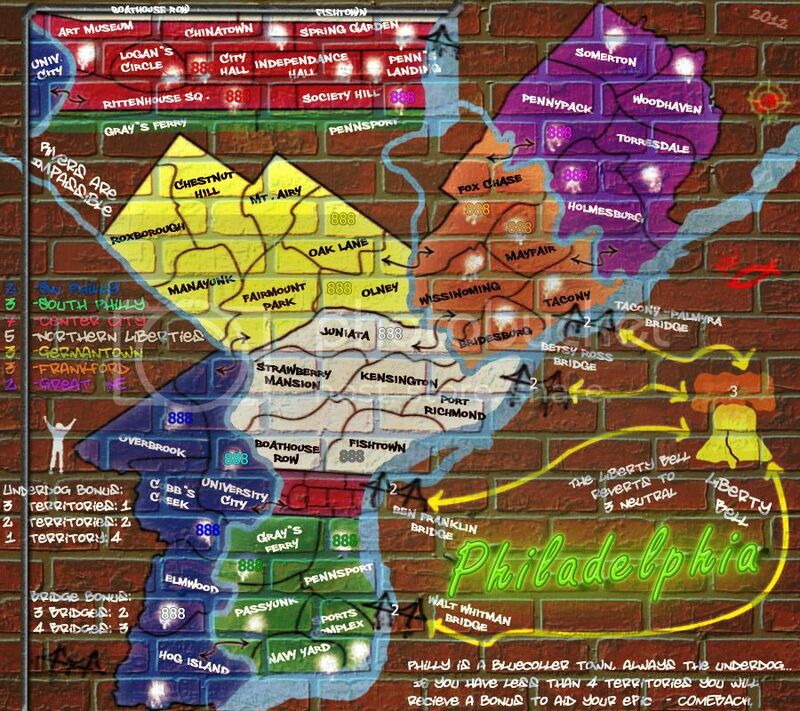 In this event I'll likely change the name to something like Greater Philadelphia maybe' we'll see. Well, the best thing about Charleston are the choke points, i think. I makes the ma easier to play. 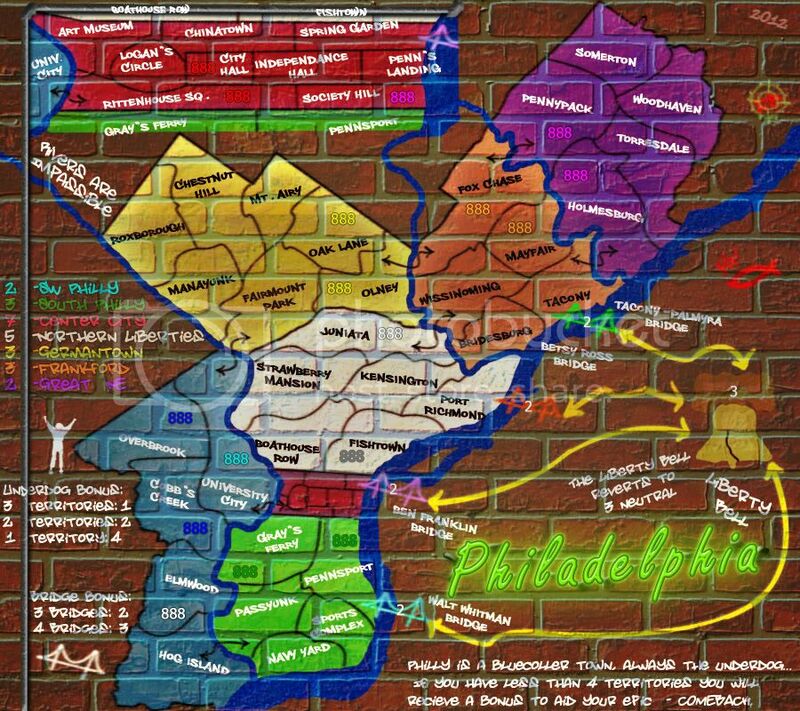 As EvilD mentioned, some incorporation of the History is something I'd support, rather than any strictly modern-city map. 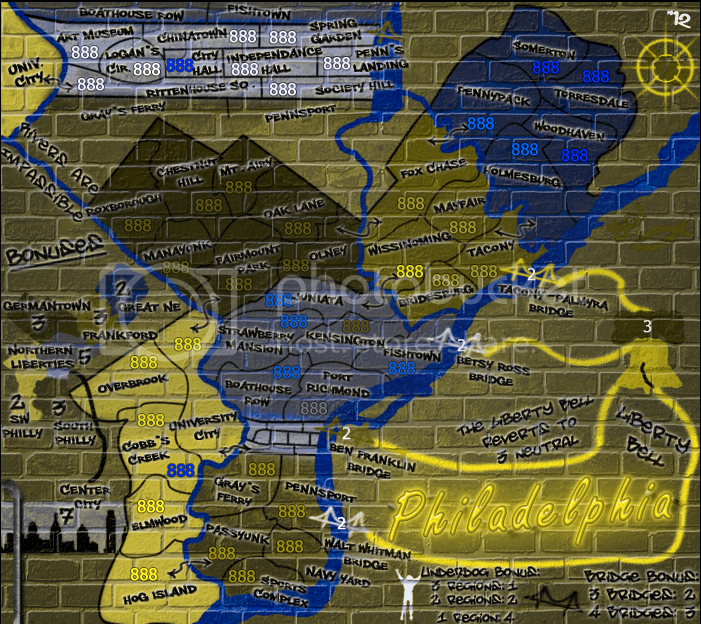 It'd help set the map apart from the various other city maps we have had that failed. Now the foundry has churned out a lot of cities over the past year or so which was needed but having a few more clean cities would be great from my perspective. barterer2002 wrote: There are very few clean city maps out there at the moment, most have some sort of tricky gameplay. Montreal is almost entirely standard gameplay: It has one small subcontinent worth 1 troop; I'd hardly consider it to be 'tricky'. San Francisco is also pretty darn close to standard and you won't really lose much advantage if you play it as such. Vancouver and New York also essentially behave like standard maps. I don't think we really have a dearth of standard urban gameplay. 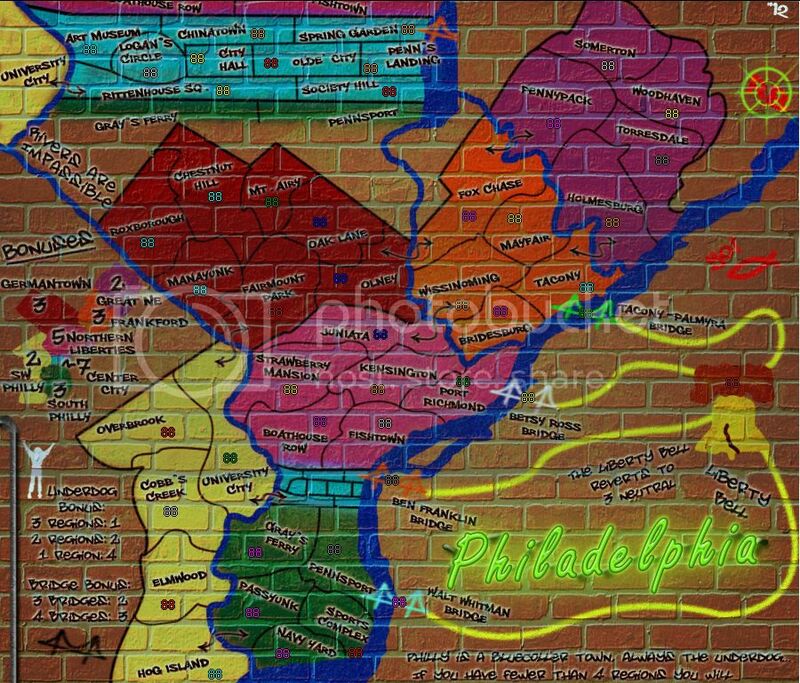 Incidentally, some of the maps you listed aren't really cities. Puget Sound covers a much larger region, Pearl Harbor is a naval base, and Poison Rome is a family tree. I understand what they are. 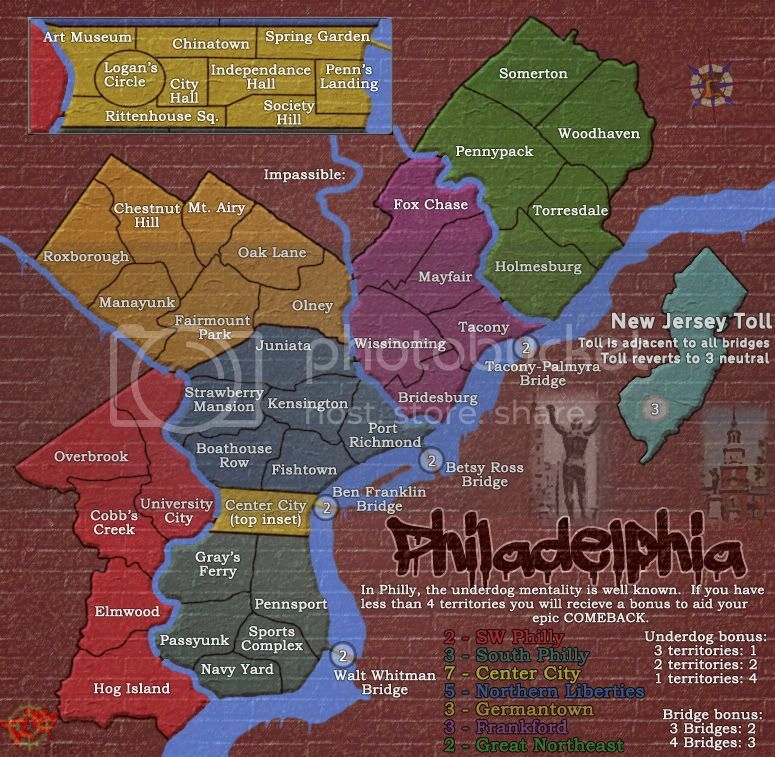 I'm looking for anything I can use in a tournament when I need a city. There are about 10 clean maps to use for cities which include Puget Sound and if I want to include the messy stuff there are 16. What I'm saying is that I disagree with the idea that having a clean map without having gimmicks and such isn't the bad thing that Andy is portraying. I think there is a tendency in the foundry to go for new gameplay features and to ignore the mapmaking part of things. barterer2002 wrote: I understand what they are. 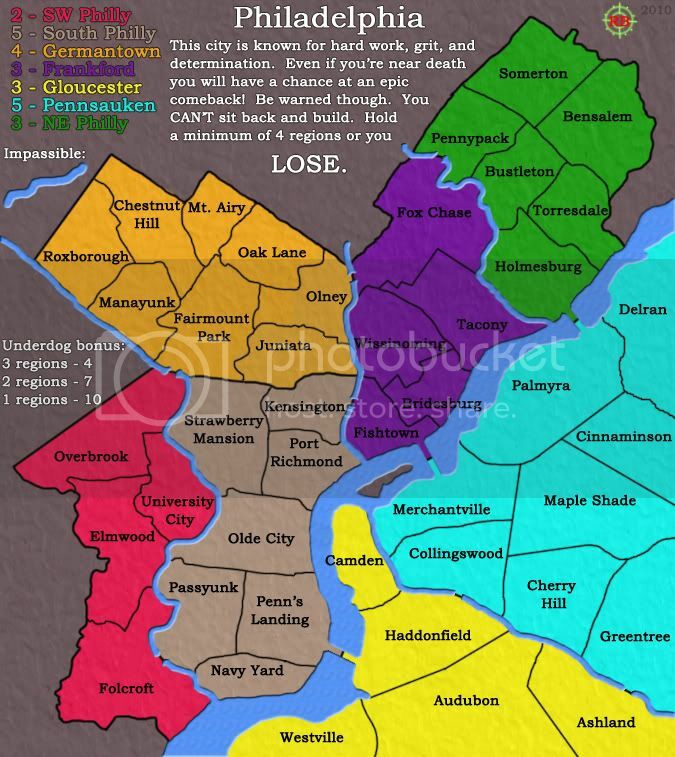 I'm looking for anything I can use in a tournament when I need a city. There are about 10 clean maps to use for cities which include Puget Sound and if I want to include the messy stuff there are 16. What I'm saying is that I disagree with the idea that having a clean map without having gimmicks and such isn't the bad thing that Andy is portraying. I think there is a tendency in the foundry to go for new gameplay features and to ignore the mapmaking part of things. I think you are mis-characterizing my post. I didn't say anything about gimmicks or tricks---just an inclusion of history since it is one of the historical sites in the USA. It can still certainly be clean and standard. Perhaps I did read it wrong Andy, my apologies for mis-characterizing your point. I read your comment as disliking the idea and attributed my own reason to you which isn't what you said. 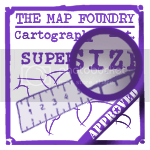 I've always been a fan of standard maps over anything complex, tricky, or in similar veins. 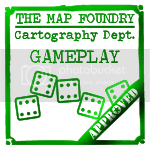 So I most always endorse a map if it has terrific graphics theme, and standardish game play. I'm interested in seeing how the project develops. 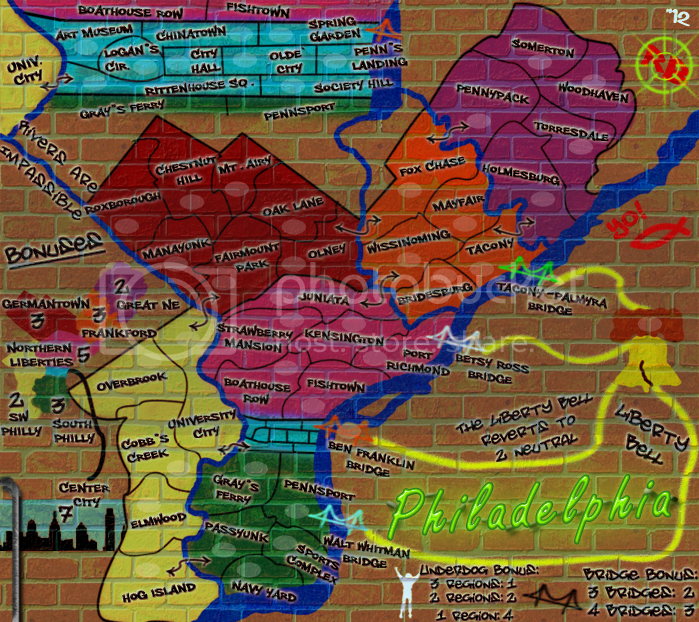 I think City maps can be interesting...especially once we start to get into the 'famous cities of the world' category. It'd be an enjoyable thematic series I think, should anyone climb up that banana tree. hmmmm, interesting, I could go a little bit bigger and encompass the surround tri-state region, Philadelphia and it's suburbs, or.... maybe go a bit smaller and focus of the core of the City of Philadelphia itself, which is generally Center City and South Philly, which could make it easier in incorporate historic monuments and other places of interest in Philly. hmmmmm smaller might be better., what do you guys think?